Identify allylic alcohols in the above examples. The alcohols given in (ii) and (vi) are allylic alcohols. Name the following compounds according to IUPAC system. Give structures of the products you would expect when each of the following alcohol reacts with (a) HCl-ZnCl2 (b) HBr and (c) SOCl2. Primary alcohols do not react appreciably with Lucas’ reagent (HCl-ZnCl2) at room temperature. Tertiary alcohols react immediately with Lucas’ reagent. It can be observed that the presence of nitro groups increases the stability of phenoxide ion. Write the reactions of Williamson synthesis of 2-ethoxy-3-methylpentane starting from ethanol and 3-methylpentan-2-ol. In Williamson synthesis, an alkyl halide reacts with an alkoxide ion. Also, it is an SN2 reaction. In the reaction, alkyl halides should be primary having the least steric hindrance. Hence, an alkyl halide is obtained from ethanol and alkoxide ion from 3-methylpentan-2-ol. 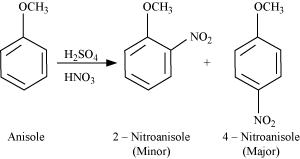 Which of the following is an appropriate set of reactants for the preparation of 1-methoxy-4-nitrobenzene and why? Set (ii) is an appropriate set of reactants for the preparation of 1-methoxy-4-nitrobenzene. 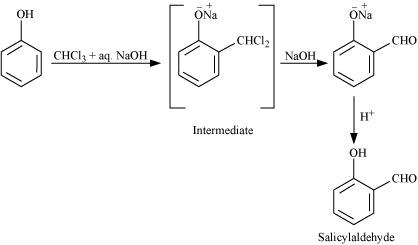 In set (i), sodium methoxide (CH3ONa) is a strong nucleophile as well as a strong base. Hence, an elimination reaction predominates over a substitution reaction. (i) Draw the structures of all isomeric alcohols of molecular formula C5H12O and give their IUPAC names. (ii) Classify the isomers of alcohols in question 11.3 (i) as primary, secondary and tertiary alcohols. Explain why propanol has higher boiling point than that of the hydrocarbon, butane? Therefore, extra energy is required to break hydrogen bonds. For this reason, propanol has a higher boiling point than hydrocarbon butane. Alcohols are comparatively more soluble in water than hydrocarbons of comparable molecular masses. Explain this fact. Alcohols form H-bonds with water due to the presence of −OH group. However, hydrocarbons cannot form H-bonds with water. As a result, alcohols are comparatively more soluble in water than hydrocarbons of comparable molecular masses. What is meant by hydroboration-oxidation reaction? Illustrate it with an example. The addition of borane followed by oxidation is known as the hydroboration-oxidation reaction. For example, propan-1-ol is produced by the hydroboration-oxidation reaction of propene. 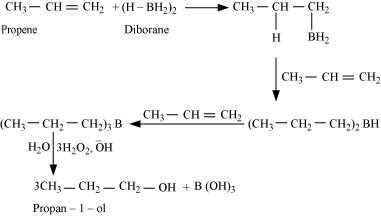 In this reaction, propene reacts with diborane (BH3)2 to form trialkyl borane as an addition product. This addition product is oxidized to alcohol by hydrogen peroxide in the presence of aqueous sodium hydroxide. Give the structures and IUPAC names of monohydric phenols of molecular formula, C7H8O. While separating a mixture of ortho and para nitrophenols by steam distillation, name the isomer which will be steam volatile. Give reason. Intramolecular H-bonding is present in o-nitrophenol. In p-nitrophenol, the molecules are strongly associated due to the presence of intermolecular bonding. Hence, o-nitrophenol is steam volatile. Give the equations of reactions for the preparation of phenol from cumene. To prepare phenol, cumene is first oxidized in the presence of air of cumene hydro-peroxide. Then, cumene hydroxide is treated with dilute acid to prepare phenol and acetone as by-products. Write chemical reaction for the preparation of phenol from chlorobenzene. Chlorobenzene is fused with NaOH (at 623 K and 320 atm pressure) to produce sodium phenoxide, which gives phenol on acidification. Write the mechanism of hydration of ethene to yield ethanol. The mechanism of hydration of ethene to form ethanol involves three steps. You are given benzene, conc. H2SO4 and NaOH. Write the equations for the preparation of phenol using these reagents. (i) 1-phenylethanol from a suitable alkene. (ii) cyclohexylmethanol using an alkyl halide by an SN2 reaction. (iii) pentan-1-ol using a suitable alkyl halide? (i) By acid-catalyzed hydration of ethylbenzene (styrene), 1-phenylethanol can be synthesized. (ii) When chloromethylcyclohexane is treated with sodium hydroxide, cyclohexylmethanol is obtained. (iii) When 1-chloropentane is treated with NaOH, pentan-1-ol is produced. Give two reactions that show the acidic nature of phenol. Compare acidity of phenol with that of ethanol. (i) Phenol reacts with sodium to give sodium phenoxide, liberating H2. (ii) Phenol reacts with sodium hydroxide to give sodium phenoxide and water as by-products. The acidity of phenol is more than that of ethanol. 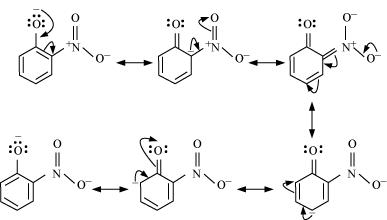 This is because after losing a proton, the phenoxide ion undergoes resonance and gets stabilized whereas ethoxide ion does not. Explain why is ortho nitrophenol more acidic than ortho methoxyphenol? The nitro-group is an electron-withdrawing group. The presence of this group in the ortho position decreases the electron density in the O−H bond. As a result, it is easier to lose a proton. Also, the o-nitrophenoxide ion formed after the loss of protons is stabilized by resonance. Hence, ortho nitrophenol is a stronger acid. On the other hand, methoxy group is an electron-releasing group. Thus, it increases the electron density in the O−H bond and hence, the proton cannot be given out easily. For this reason, ortho-nitrophenol is more acidic than ortho-methoxyphenol. Explain how does the −OH group attached to a carbon of benzene ring activate it towards electrophilic substitution? The −OH group is an electron-donating group. Thus, it increases the electron density in the benzene ring as shown in the given resonance structure of phenol. As a result, the benzene ring is activated towards electrophilic substitution. (i) Oxidation of propan-1-ol with alkaline KMnO4 solution. (ii) Bromine in CS2 with phenol. (iii) Dilute HNO3 with phenol. (iv) Treating phenol with chloroform in presence of aqueous NaOH. 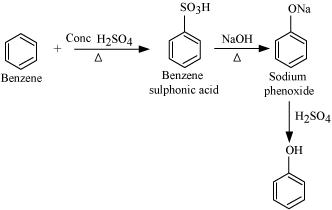 When phenol is treated with sodium hydroxide, sodium phenoxide is produced. This sodium phenoxide when treated with carbon dioxide, followed by acidification, undergoes electrophilic substitution to give ortho-hydroxybenzoic acid as the main product. This reaction is known as Kolbe’s reaction. When phenol is treated with chloroform (CHCl3) in the presence of sodium hydroxide, a −CHO group is introduced at the ortho position of the benzene ring. This reaction is known as the Reimer-Tiemann reaction. The intermediate is hydrolyzed in the presence of alkalis to produce salicyclaldehyde. 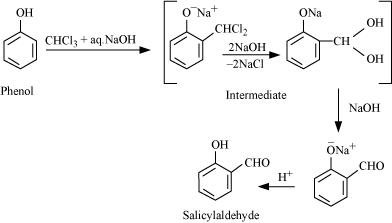 Williamson ether synthesis is a laboratory method to prepare symmetrical and unsymmetrical ethers by allowing alkyl halides to react with sodium alkoxides. This reaction involves SN2 attack of the alkoxide ion on the alkyl halide. Better results are obtained in case of primary alkyl halides. If the alkyl halide is secondary or tertiary, then elimination competes over substitution. An unsymmetrical ether is an ether where two groups on the two sides of an oxygen atom differ (i.e., have an unequal number of carbon atoms). For example: ethyl methyl ether (CH3−O−CH2CH3). Write the mechanism of acid-catalysed dehydration of ethanol to yield ethene. The acid consumed in step 1 is released in Step 3. After the formation of ethene, it is removed to shift the equilibrium in a forward direction. (iii) Ethyl magnesium chloride → Propan-1-ol. (iv) Methyl magnesium bromide → 2-Methylpropan-2-ol. (i) If propene is allowed to react with water in the presence of an acid as a catalyst, then propan-2-ol is obtained. (ii) If benzyl chloride is treated with NaOH (followed by acidification) then benzyl alcohol is produced. 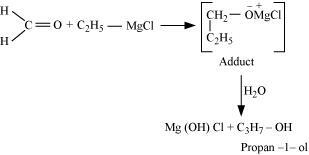 (iii) When ethyl magnesium chloride is treated with methanal, an adduct is the produced which gives propan-1-ol on hydrolysis. 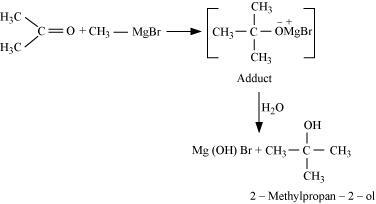 (iv) When methyl magnesium bromide is treated with propane, an adduct is the product which gives 2-methylpropane-2-ol on hydrolysis. (i) Oxidation of a primary alcohol to carboxylic acid. (ii) Oxidation of a primary alcohol to aldehyde. (iii) Bromination of phenol to 2,4,6-tribromophenol. (iv) Benzyl alcohol to benzoic acid. (v) Dehydration of propan-2-ol to propene. Give reason for the higher boiling point of ethanol in comparison to methoxymethane. Ethanol undergoes intermolecular H-bonding due to the presence of −OH group, resulting in the association of molecules. Extra energy is required to break these hydrogen bonds. On the other hand, methoxymethane does not undergo H-bonding. Hence, the boiling point of ethanol is higher than that of methoxymethane. Illustrate with examples the limitations of Williamson synthesis for the preparation of certain types of ethers. The reaction of Williamson synthesis involves SN2 attack of an alkoxide ion on a primary alkyl halide. But if secondary or tertiary alkyl halides are taken in place of primary alkyl halides, then elimination would compete over substitution. As a result, alkenes would be produced. This is because alkoxides are nucleophiles as well as strong bases. Hence, they react with alkyl halides, which results in an elimination reaction. How is 1-propoxypropane synthesised from propan-1-ol? 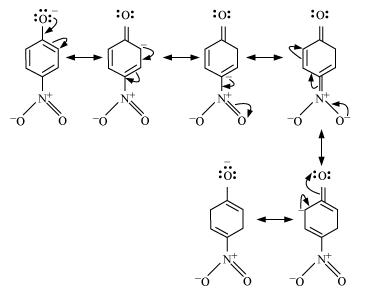 Write mechanism of this reaction. 1-propoxypropane can be synthesized from propan-1-ol by dehydration. Propan-1-ol undergoes dehydration in the presence of protic acids (such as H2SO4, H3PO4) to give 1-propoxypropane. Preparation of ethers by acid dehydration of secondary or tertiary alcohols is not a suitable method. Give reason. The formation of ethers by dehydration of alcohol is a bimolecular reaction (SN2) involving the attack of an alcohol molecule on a protonated alcohol molecule. In the method, the alkyl group should be unhindered. In case of secondary or tertiary alcohols, the alkyl group is hindered. As a result, elimination dominates substitution. Hence, in place of ethers, alkenes are formed. (ii) It directs the incoming substituents to ortho and para positions in benzene ring. In aryl alkyl ethers, due to the +R effect of the alkoxy group, the electron density in the benzene ring increases as shown in the following resonance structure. Thus, benzene is activated towards electrophilic substitution by the alkoxy group. (ii) It can also be observed from the resonance structures that the electron density increases more at the ortho and para positions than at the meta position. As a result, the incoming substituents are directed to the ortho and para positions in the benzene ring. Write the mechanism of the reaction of HI with methoxymethane. (i) Friedel-Crafts reactionâˆ’alkylation of anisole. 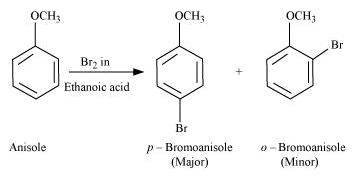 (iii) Bromination of anisole in ethanoic acid medium. (iv) Friedel-Craftâ€™s acetylation of anisole. Show how would you synthesise the following alcohols from appropriate alkenes? The given alcohols can be synthesized by applying Markovnikov’s rule of acid-catalyzed hydration of appropriate alkenes. Acid-catalyzed hydration of pent-2-ene also produces pentan-2-ol but along with pentan-3-ol. Thus, the first reaction is preferred over the second one to get pentan-2-ol. stable tertiary carbocation by a hydride ion shift from 3rd carbon atom.